Congratulations to THLord Kuma, Premier Equestrian Champion! 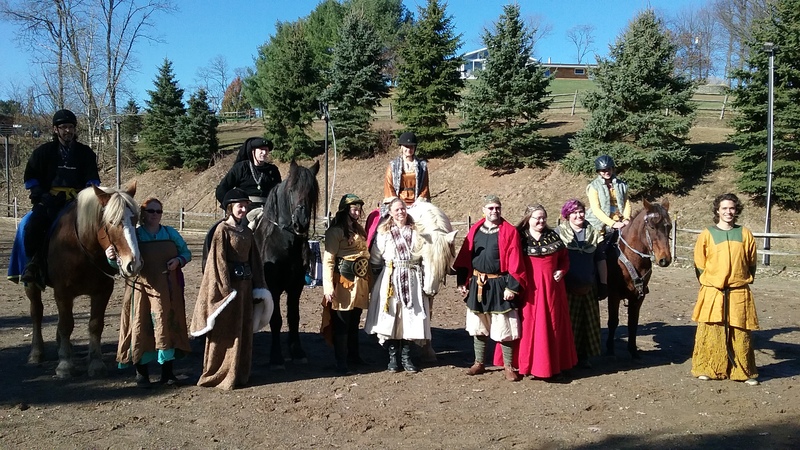 On Friday November 24th Lady Gesa von Wellenstein hosted the Debatable Lands First ever Equestrian Championship, and we proudly Present THLord Kumagaya Kentarou Masamoto as the victor of the tournament and Our Premier Equestrian Champion! This being the holiday season, and everyone being busy, busy, busy, our weekly A and S evenings will be on hiatus until late January or early February. Thank you all for attending our meetings, I hope they were fun! I will be scheduling some interesting things next year, like Fingerloop Braiding, Elizabethan Fairies, perhaps another round of Fletching, more on cooking, sewing, largess making — lots to keep us busy. I hope to see many of you at various practices and events, such as the BMDL 12th Night Celebration. 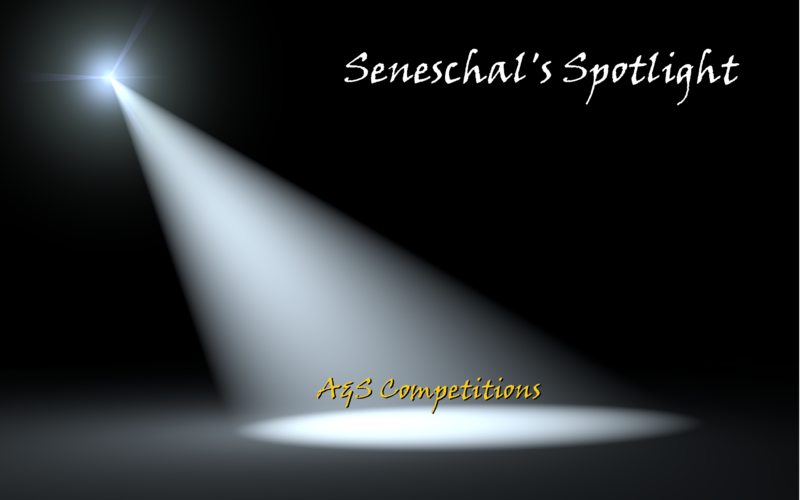 There will be an A&S competition there, and I hope some of you will enter. Happy All Holidays, may everything be merry and bright, and warm and wonderful! Hello everyone. Want to learn how to shade acanthus leaves like a boss? Or learn basic calligraphy? Or try a “scary” Black Hours scroll? (And discover that they’re actually a piece of cake!) Lady Ceindrich and I will be hosting the third Scribal East (With Music!) get-together this Thursday 11/30 at Lady Ceindrich’s home in Monroeville. (PM me or check Dark Pages for address.) Beginner recorder will start at 6:30, and I have recorders and music available. Scribal will start at 7. Come play with us! On-Line Heraldic Office Hours starts now! On-Line Heraldic Office Hours – tonight! Greetings from your Comet Pursuivant! I will be holding On-Line Office Hours from 7-9pm tonight. The Google Hangout link will be posted separately around 7pm. Join me with your heraldic questions, confusions, or frustrations! I will be here to help you how I can! At our recent Harvest Revel, there was a bid for an event called “Tavern in the Park” to be held on 10 February 2018, which is meant to encourage newer participants in the BMDL to volunteer to be in charge of the various aspects of making an event happen. What the autocrat, THLady Elß, is looking for are people who have considered volunteering to help run something at an event, but were nervous to do so. One of the areas that is looking for leadership is for an A&S activity like a competition, display, etc. You would have a mentor to help you navigate this role (me) and could choose from any form that appeals to you. First, let’s talk about why doing something like this is meaningful to what we do in the Arts and Sciences. Displaying your work in any context serves a few purposes; getting feedback on your work so you can improve your work, talking to people who do similar things, stretching yourself to the next level of achievement in your art or science, being able to show your incredibly cool thing to other people, and familiarizing people with your particular talent. For some people, having a deadline is what drives them to complete a particular project, for other people a deadline makes them crazy and they’d rather just finish things as they finish them. Not every venue is perfect for every artisan so it’s best to focus on what is going to be most beneficial for your particular group or that works best with how you, personally, find benefit as it’s easier to encourage people to join you in something when it’s something that you personally care about. There are four modes of showing your work that are used most frequently in Æthelmearc, and all have their advantages and disadvantages. These advantages and disadvantages are completely related to how the individual likes to show their work. There is no perfect mode, and there is no perfect situation that will suit absolutely everyone. This is not a definitive list and there are other forms of doing this, these are the ones that may be most familiar to you from attending events. The first venue is a competition. In a competition, there are winners and losers, and those who enter an item are there to do their best and to score as highly as possible within their category. This is the kind of venue that I personally prefer because the competitive aspect of it appeals to me and makes me stretch my skills, but, as stated earlier, this doesn’t mean that it’s a good choice for everyone. There are different kinds of competitions, most of which have some kind of theme (either in keeping with the overall theme of the event, or focusing on a specific time frame) and may have a limited set of categories that one can create entries for. There are also larger more involved competitions such as the Ice Dragon Pentathalon that have very broad categories and a number of categories that an item can be entered under. The second venue is the A&S Display. This is a non-competitive environment that is geared towards showing work that is being done by local Artisans and Scientists. As the name implies, you display your work along with any documentation that you may have so that people can look at what you’ve been doing. This is done without the presence of the artisan or scientist. The third venue is the Artisan’s Forum. The Forum is a lot like the Display, but ideally involves the person sitting with their work and talking about what they’ve done or answering questions. It’s an opportunity for people to talk more in-depth about their work and what they’ve been learning in an environment that is more of a dialog between people than a competition or display. This provides the greatest opportunity for an artisan to really educate people about what they’re doing, especially if it’s something very new to the person visiting your display. The final venue is the “Artisans’ Playtime”, this is when an artist or scientist puts together an interactive display where people can sit down and actually learn how to do your particular art or science. This, obviously, lends itself to more interactive arts and sciences, so it isn’t suitable for all disciplines. The benefit to something like this is that anyone can participate. At one Artisans’ Playtime my then six-year-old daughter had a table where you could look through books with various illuminated pieces and use those to make a bookmark (or not). It was was a good way to get an introduction to medieval illuminated manuscripts in a way that was fun and entirely at the pace of the person participating. I’ve seen people do make-and-take projects for leatherworking, embroidery, and even sewing. It is my preferred mode of sharing skills and information as it’s so interactive. There are advantages and disadvantages to each of these venues, and which venue you prefer is entirely personal, there is no “One True A&S Venue” that answers to all comfortability levels and addresses all of the needs of every artisan and scientist in the Kingdom. Now that you’ve had the opportunity to read about a few of the different ways that you can create a venue for people to share their work, please consider if creating this kind of opportunity is for you. If you’re interested, please contact me, Odriana, at jenn(dot)strobel(at)gmail(dot)com. I would act as your mentor, which means that I am there to help you decide what form is most appealing to you and then making sure that you have the materials to be successful. Even if this event is not well timed for you, please consider perhaps running an A&S venue at another event. If you need a mentor, I am happy to be that for you. Even if you just need someone to walk through the process with you to decide whether or not this is something that you’d like to do, please contact me. Konichiwa Debatable Lands! There will be no thrown weapons practice this Sunday, Nov 26. I’m fairly certain we are done for the year at this point. If anything changes, I will certainly inform you all. But for now, I want to say thank you for a wonderful year of throwing, of camaraderie, and of support. You all make what I do fun for me. I’m very pleased with the progress so many of you have made in the last few years. I will see you all on the range in the spring, if not before. Arigatogoziamasita!! Archery will not be occuring this weekend due to holiday events. Please stay posted for news on next week. Due to lack of interest from the regular attendees and expected poor weather, there will be no practice this Sunday, 11/26. Practice will resume next Sunday 12/3 at the Chinese Church, and we will be shifting to our winter time, which means fencing will start at 2 PM. We wanted to take a moment on this holiday to say how very grateful we are to you all. This Barony is made of such an amazing group of people – passionate, helpful, gracious, interested and interesting. We feel very lucky to be a part of such a vibrant community. Take a look around and really see who we are… the Debatable Lands is truly something special. We love you all, and Happy Thanksgiving! In Levitate et Caritate, and Cheers! PS: See you at our Premier Baronial Equestrian Championship tomorrow!